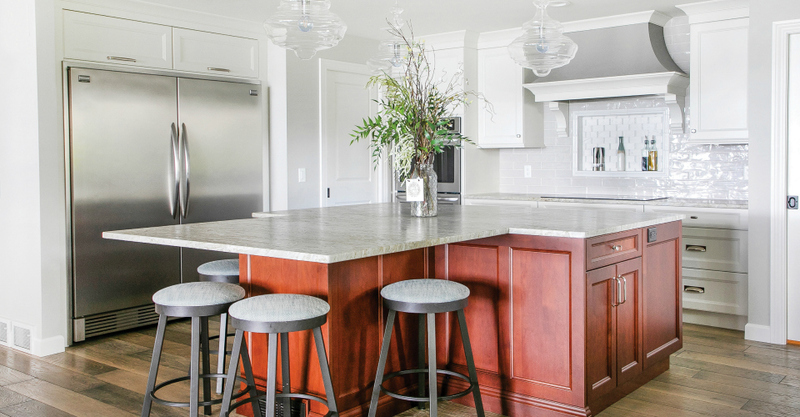 Angie and Mark Halverson are the type of people that see hidden potential in homes that could use an update, and they’re not afraid of rolling up their sleeves and doing the work. After all, they’ve flipped four houses in the Stoughton area. Then Angie’s parents called the couple to let them know that their neighbors two doors down on Lake Kegonsa were moving to Minnesota and selling their home—would Angie and Mark like to take a look at the house? It also happened to be in the exact area they wanted to be in—close to Stoughton Country Club—and of course, on the water. Angie, Mark, and teenage daughters Kendra and Karlie walked through the home a few times and decided to move forward with the sale. However, the couple also knew that the home needed a bit of work to make it uniquely theirs. A three-quarters wall closed off the small eat-in kitchen from the dining room and sitting area, which then opened into an expansive living room with vaulted ceiling and beautiful lake views. If they could get rid of the walls there, a gorgeous lake view would greet them from the kitchen, too. “We knew the potential … [that] once we knocked down two walls, we would have a huge entertaining area. We [wanted to] make this a huge kitchen to entertain in and have this whole open concept,” Angie explains. The couple enlisted Dream House Dream Kitchens to help them reimagine much of the ranch’s main level, which also included knocking down some walls in the home’s entryway and front hallway to make the floorplan more open. The four-month-long renovation process with Dream House Dream Kitchens was “phase one” of the home’s planned changes, says Angie. Phase two involved redoing the home’s exterior siding, and adding on a lovely three-season porch. The kitchen was the main area of focus for the couple. The previous layout had the three-quarters wall and two islands that left the layout feeling closed off and not very functional. They removed the wall and the islands— and the kitchen was suddenly flooded with light. A huge 8 1/2-by-7 1/2-foot leathered granite island was installed as the centerpiece of the (now) large kitchen. A pantry was carved out in the corner, and a small mudroom that leads to the garage was also revamped in the other corner. A double fridge holds all of the essentials for the family and a microwave is tucked in the large island to keep visual clutter to a minimum. Angie also loves the sleek light gray tile backsplash throughout the kitchen, the custom stove hood and new white cabinetry (both crafted by Dream House Dream Kitchens) and the glamorous Madison Lighting pendant lamps that hang above the island. It’s clear this room is for groups to gather in. “I had no idea this island would be this amazing and I was so excited when we placed it in. Everybody is always in the kitchen,” says Angie. Adjoining the kitchen is the dining room and quaint sitting area with original stone fireplace that the couple wanted to preserve. A pair of chairs sit at the ready in front of the fireplace and it’s often where they can find Fancy, the family’s Golden Retriever, lounging in front of. Angie decided to keep the cherry built-ins around the fireplace to break up the white trim throughout the rest of the house. It’s a nice touch that hearkens back to the home’s roots. Next to the dining area is a large family room add-on with vaulted ceiling, floor-to-ceiling windows and built-in bookcases that the previous owner designed himself. “I love this room because [the original owner] was an engineer, and he had such great ideas. 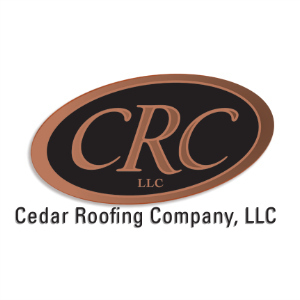 The work in here was excellent quality,” says Angie. Angie decorated the room in her signature “coastal glitz” style with navy and white furnishings from Waunakee Furniture ETC and Steinhafels, and sea-inspired décor pieces. The couple left the ceiling beam and built-in bookcases (not shown) in the original cherry to break up the continuity of white trim. Adjacent to the family room is the three-season porch add-on that the couple adore. They worked with Jim McMillan of Premium Construction (who also redid all of the home’s siding) to effectively integrate the new room into the home’s layout, so from the exterior, one can’t even tell that the room is a new addition. The heated floors, shiplap walls, comfortable exterior furnishings and teak dining table invite guests to come right in and take a seat. This room has Angie’s stamp all over it—after all, she outfitted the ladder in the room with favorite accent pieces, and she stained all of the boards that were used on the ceiling, too. From the three-season porch’s second entrance, a former office space got turned into a combination workspace for Angie (who works from home) and entertaining spot. A mini fridge, cabinets, quartz countertops (for preparing drinks and snacks) and rustic wheeled cart all make this room flow easily into the home’s layout. The hallway that attached the former office to the living areas was also opened up by Dream House Dream Kitchens so the office/entertaining space is completely open, as is the home’s front entryway—which was previously partially enclosed by the hallway. What didn’t change in the home was all of the bedrooms—the master suite was thoughtfully added on by the previous owners at the far end of the house, and the couple did slight updates in the master bath, but left the bedroom as is. A small den (that was the original master bedroom, before the addition) with pocket doors across from the entertaining area works well for quiet reading sessions, or, for an extra bedroom for guests. Barely noticeable is the cute, tiny full bath also fitted into the den that the couple left unchanged. The sky-blue tile and white walls are charmingly retro. In contrast, a full, more spacious bathroom (also redone by Dream House Dream Kitchens) near the front entryway is a spa-like retreat with a tiled wall, a luxurious soaking tub and neutral palette. The home’s livability are major pluses for the family of four, who use each space in the home purposefully. The major updates the couple did on the main floor make it a retreat—but for every day.